Safe drinking water is the basic need of all human beings. Generally, water is contaminated with bacteria, viruses, salts and various organic compounds. This impure water causes many waterborne diseases, killing over 3 million people and seriously sickening hundreds of million each year worldwide (See WHO website, http://www.who.int/). Existing technologies for water purification include mechanical filtration, reverse osmosis (RO), distillation, ultraviolet (UV) disinfection, chlorination and ozonation. Each of these technologies suffers from various limitations. Out of the existing water purification technologies, UV disinfection has been known to be the most efficient method. In the existing UV-lamps, environmentally hazardous mercury is used for generation of UV light radiation at peak germicidal wavelength (254 nm). CSIR-CEERI has developed a mercury-free VUV/UV lamp with a novel structural design and an optimised gas mixture that produces strong spectral bands peaking at wavelengths of 253 nm and 172 nm along with a weak band peaking at wavelength 265 nm, which are highly useful for water sterilization. This invention alleviates the problems of mercury lamps by virtue of its unique design and the composition of active discharge elements. 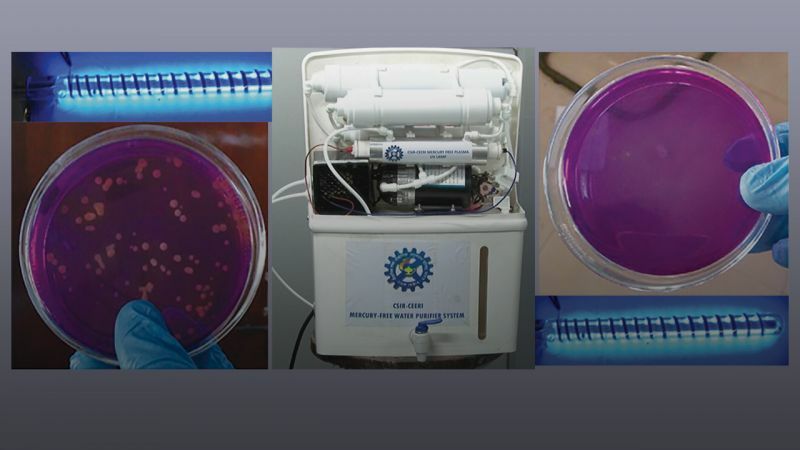 As a result, it is able to produce the desired VUV/UV wavelengths for the deactivation of bacteria and viruses most efficiently (without the use of mercury). Industries Benefitted: The performance of the MFP-UV-lamp was demonstrated to 35 industries across the country. One-day technology awareness workshops were organised on June 26, 2015 at CSIR-CEERI, Pilani and on January 29, 2016 at BISR, Jaipur for industrial participants. The technology was also demonstrated at the 2nd Indian Industrial Fair organised at Jodhpur (October 3-5, 2015) and at Pride of India Expo Exhibition-2016 (January 3-7, 2016), Mysore. A nondisclosure agreement was signed with M/s Sahajanand Laser Technology Ltd., Gandhinagar, M/s INFUSIL India Pvt. Ltd., Bangalore, M/s Kubde Corporation Pvt. Ltd, Amravati, M/s METRO Electronic Lab, New Delhi, M/s YOUWE (UV) Purifiers, Jaipur and M/s ARKIN Technologies Pvt. Ltd. Pune. The technology was transferred to two industries namely, M/s YOUWE (UV) Purifiers, Jaipur and M/s ARKIN Technologies Pvt. Ltd. Pune on March 29, 2016.